We don’t know the Slovakian engine’s displacement. If that Skyactiv-X is a 2.0-liter, it compares to our 2.0-liter Skyactive-G in the Mazda3 that makes 155 hp and 150 lb-ft, or the tuned Skyactiv-G in the 2019 Miata that makes 181 hp and 151 lb-ft. According to the spec sheet on the Slovakian Mazda site, their 2.0-liter Skyactiv-G in the CX-3 makes 148 hp and 152 lb-ft, and in their Mazda6 makes 162 hp and 155 lb-ft. 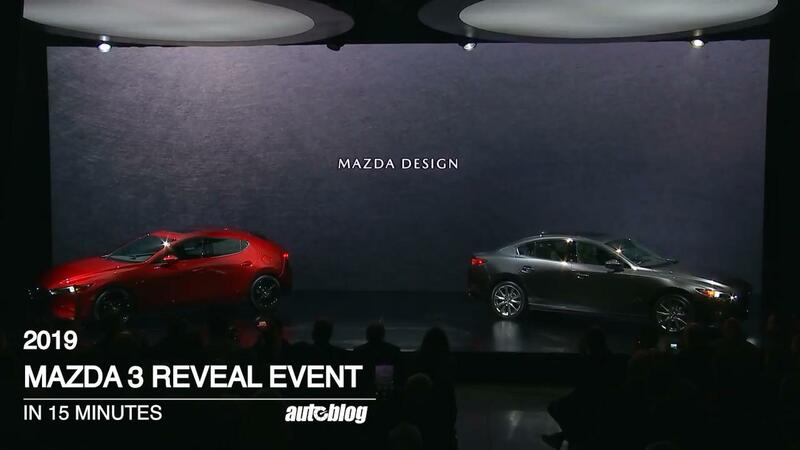 According to the brochure, those numbers will rise to 164 hp and 157 lb-ft in the coming Mazda3. The Skyactiv-X numbers are in sight of what reps at Mazda in California gave us for output during our drive, which was closer to 190 hp and 180 lb-ft. Mazda said at the L.A. Auto Show last year that the Skyactiv-X would launch in markets with stricter emissions regulations first, so a small European market with tighter controls doesn’t define what we get. Given our less restrictive environment, tuning for more power shouldn’t be a moon shot. Doing so would put the Skyactiv-X in with the optional 2.5-liter four-cylinder in the U.S. Mazda3, which makes 184 hp and 185 lb-ft.
We have questions about this strategy, but we’ll have to see how the pricing works out. Since the 2.5-liter serves as the base engine on the 2019 Mazda3, buyers can expect a meaningful premium to get into a Skyactiv-X. Right now, there’s a $1,495 surcharge to go from the current 2.0-liter Mazda3 hatch to the 2.5-liter. Yet, with power numbers and driving dynamics similar to the 2.5-liter, if fuel economy is the differentiator, how much will buyers be asked to pay on the lot in order to save gas on the road?